I don’t know about you, but I can use all the baking tips I can find. Check out these gluten free tips by Kyra Bussanich, a three-time winner of The Food Network’s, Cupcake Wars. 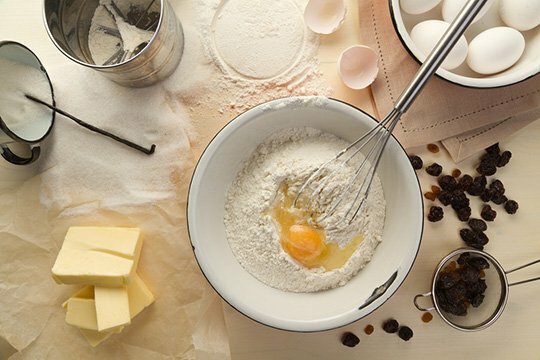 • If you’re following a recipe, don’t substitute the listed flour or starch with another type unless you’re familiar with its properties.There are many different types of gluten-free flours and starches, including millet, sorghum and sweet white rice flour, and potato and tapioca starches. Each has its own idiosyncrasies. For example, millet flour has a slightly nutty flavor and is well-suited for goods with a hearty texture. Sweet white rice flour holds moisture well and is good for recipes that have a slight gumminess to them. Potato starch is light and good for fluffy cakes. • Use eggs and butter at room temperature.Eggs are often used as a binder, the protein that substitutes for the missing gluten. Eggs and butter are both easier to work with when used at room temperature, and room-temperature egg whites whip up fluffier. If you forget to pull the butter out of the refrigerator beforehand, heat it for 7 to 12 seconds in the microwave. Put cold eggs in warm (not hot) water for 30 to 60 seconds. • Heat higher, cream longer for lighter cakes.One complaint people sometimes have about gluten-free baked goods is that they’re too dense. To prevent this, try setting the oven temperature 25 degrees warmer than you would for flour. This will cause the butter in the recipe to release its water as steam, which helps the cake rise quickly. Also, cream eggs and butter together longer – about 10 minutes – than you would for flour cakes. Kyra’s baking is superb! Best I’ve eaten, GF or not (Cupcake Wars judges agree). Her book, “Sweet Cravings”, has 50 great, delicious, creative treats, many of them really easy to make (thank goodness for me). Haha are you her manager Peter? Thank you for the info. These are some very useful tips. I’ve been cooking and baking gluten free and in the beginning tried substituting different GF flours for what was actually called for in the recipe. Some were a success and other had such strange tastes (because of the different flavours of the flours.) Live and learn I guess! I never knew about the higher heat for butter or the difference of using room temperature eggs. Thanks for the tips!